In the previous post, we shared a detailed guide on Rise Of Civilizations game(check here). Today, in this post, we are going to share a detailed guide PvP battles & Expedition mode. In the expedition mode, you complete the challenges to obtain precious items such as Sculpture, speed boosters, and more. And in the PvP mode, you invade other governors’ city and loot their resources. If you are not getting victories in the battles or you are having trouble completing the challenges in expedition mode, then you should read this post completely. Let’s start the Rise Of Civilizations Battle guide; expedition and PvP. Unlike PvP mode, In expedition mode, you can manually control the units or troops. It means you have full control over the army. In the initial challenges, you will battle against two armies. Tap the enemy group and hit the attack option. After it, tap the march option to send your troops there. In most of the stages, all the enemy groups will be close to each other. If you send the troops directly to there, then both the group will invade your group at the same time and chances are this will finish your side. For instance; two enemy groups are in the center of the battlefield. Move the army to the left side of a particular group. It should not be too close or far. Once you move the army near the enemy group, they will come towards you(then tap the enemy group and hit the march option). In short, you should not attack both the groups together. [but only if your load power is low]. Before you hit the start button, the game will show you the number of enemy groups and the objectives you have to complete in order to obtain 3-stars. Tap the enemy group and check the troops’ details. 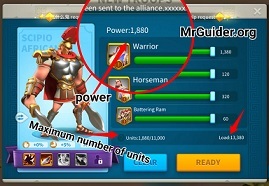 For example; their troops have 1000 power(1000*2=2000). Then your army should have more 2,000 power in order to get the victory. To increase the power, add more troops to the army by training. After tapping the challenge button, on the next screen, at the top-right corner, tap the commander icon and choose the number of troops you want to send on the expedition. You can check the power there. You can also check the maximum number of units you can choose on that screen. 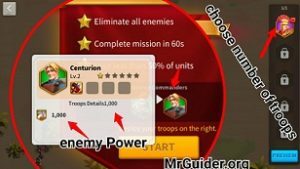 Train more troops, add them and get the victories easily. In PvP mode, before you send the troops to invade the enemy’s city, make sure to check its power. Just tap the enemy city and a pop-up will appear with enemy details; power, kills, and more. Note the power. Tap the attack option -> new troops -> select the troops and confirm. But make sure that your troops’ power should exceed the enemy’s power. Otherwise, you will end up in failure and lose your units. For more details, use the scout option. So this is the Rise Of Civilizations battle guide for the beginners. Don’t forget to read our main guide(link is given above).